GOOD MORNING AMERICA host fishes, is an early pioneer of Flying Lure. Home > GOOD MORNING AMERICA host fishes, is an early pioneer of Flying Lure. 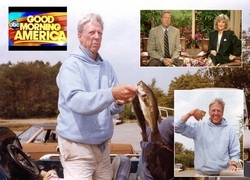 One of the most memorable episodes in the annals of Flying Lure history was fishing with David Hartman, the original host of ABC’s Good Morning America. This happened right before we were on TV. David inspired us to believe that we could actually succeed. It wasn't long hence that we'd be on TV as well. We fished together several times. I’ll never forget David coming up to Massachusetts with his 2 young sons to go fishing with me. We fished on Cape Cod, the Agawam River and South Watuppa Pond. It was the fall of 1991 when Jim Caldwell and I were just starting to produce the original Flying Lure infomercial. David was very supportive and gave us lots of advice and encouragement. He was our first supporter who was actually on network TV and one of the original Flying Lure users. My favorite David Hartman story is, one day, David called my house to make plans to go fishing. I wasn’t home and he got my mom who answered the phone. David amusedly recalled the story of that phone call to me later. After he introduced himself, there was a momentary silence on the phone. My mom, not one to be intimidated, recognized David and his distinctive voice from seeing him on TV for years. She couldn’t believe that the host of Good Morning America was actually calling our house and speaking with her on the phone! David thought that was very cute and worthy of repeating to me later. Libya was in the national news a few years earlier, in the 1980s. President Reagan had just bombed it in retaliation for downing PANAM 103, an American jetliner over Lockerbie, Scotland. David recalled that Mohammar Qadaffi, the ruler of Libya, who was only recently overthrown and killed, requested that Hartman come to Libya to interview him. Hartman was the only American journalist that Qadaffi trusted. David recalled flying into the Libyan desert and interviewing Qadaffi by torchlight in a tent, where he was hiding. Very surreal. David also told me that as host of Good Morning America you had to be prepared to talk about any subject in the world -- for exactly 3 minutes. What I'll always remember about David Hartman was his devotion to his boys as well as his self-deprecating humor.